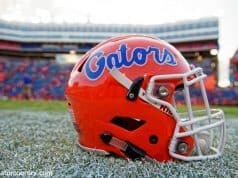 If the Gators address a few areas of concern, this could be a very strong season. After today's scrimmage, Coach Meyer gives an update on several injuries and being prepared. Brandon Spikes knows that whatever he does, he's under the watchful eye of Brandon Siler. Freshman offensive guard Ronnie Wilson had surgery on a broken ankle Saturday evening. 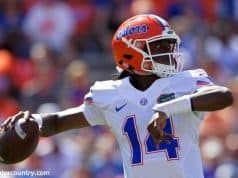 The injury bug continues to bite the Gators as more injuries pile up from today's practice session. 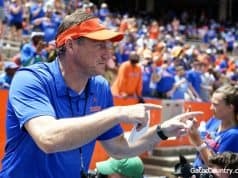 Here's our last in-depth report on the last day of open practice for the Florida Gators. Behind the humble persona of Tim Tebow lies a spirit of a battlefield warrior. Hot oppressive conditions allow Urban Meyer to find out who really loves to play football. Percy Harvin gets his thrills by turning short gains into broken field episodes on the field. Thursday was a physical day for the Gators. Here's the highlights of the day and the top 5 players. In an one on one interview with OL Simon Codrington, he talks about how much he's changed and more. Dallas Baker didn't always have such a flattering list of nicknames. Now add "College Graduate." After surgeries on both shoulders, OL Jim Tartt says he's close to full speed. Steven Harris could be completely reinstated to Florida's football team by Sunday. My thoughts on how most of the positions are doing after several days of practices. In-depth look at the line of scrimmage from the last few practices. Middle Linebacker Ryan Stamper talks with Vettel on earning meaningful playing time with the Gators. 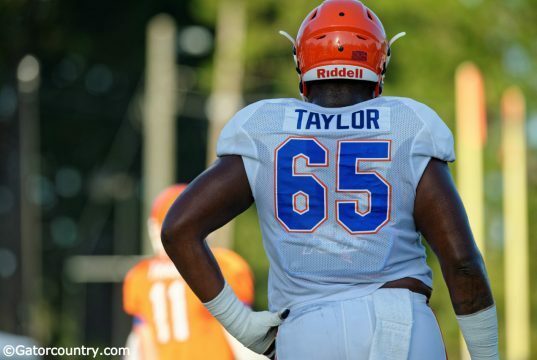 Going against these talented d-linemen will only make Florida's offensive line get better quickly.